This title was first published in 2001: Reason, Community and Religious Tradition examines key questions about the relationship of rationality to its contexts by tracing the early history of the so-called 'ontological' argument. The book follows Anselm's Proslogion from its origins in the private, devotional context of an eleventh-century monastery to its reception in the public and adversarial contexts of the friars' schools in the thirteenth century. 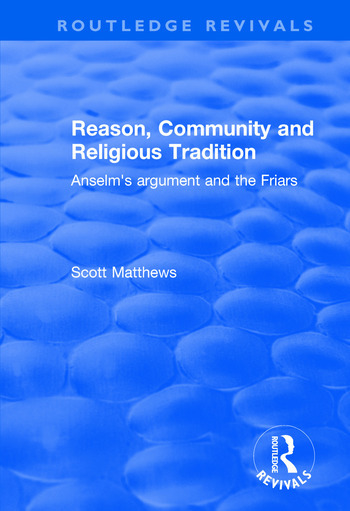 Using unpublished manuscript evidence from the Dominican and Franciscan schools at Oxford, Paris and Bologna in the thirteenth century, Matthews argues that the debate over Anselm's argument embodied the broader religious differences between the Franciscan and Dominican communities. By comparing the most famous figures of the period with their lesser-known contemporaries, Matthews argues that the Friars thought as communities and developed as traditions as they developed their arguments. This book will interest anyone concerned with the nature of rationality, and its relationship to communities and traditions, and what this entails for rational debate across cultural divides. In particular, it offers a fresh perspective on traditional approaches to the rationality of religion and religious belief. Contents: Preface; Introduction: Arguments, texts and contexts; Anselm and tradition; Encountering God within: Anselm’s argument among the early Franciscans in Paris; Other ways to God: Anselm, the early Dominicans and the friars in Oxford; Bonaventure and the Franciscan community; Thomas Aquinas and the Dominican community; Contested traditions; Conclusion; Bibliography; Index.